When I said this little German poem last night to Ashley Clark, what I remember of it, we were at her family’s table, feasting yet again. Dessen sollst du gewiss sein. Du musst für immer drinnen sein. You can be sure it’s true. That’s the way I learned it, never saw it written down, from Madeleine Somers, a kindly lady with white hair, twinkly eyes, and a soft voice who lived across Rte. 44 from us. That was the only street through Pomfret, Connecticut in 1943. Mrs. Somers’ husband, Levings Somers, had come out of retirement to help my dad by teaching in a time when all the young men had gone off to WWII. They were well into their seventies; I think he had been head of a school in Avon, Connecticut. I hope my frequent visits to their house, probably mostly unannounced, were a portion of the pleasure to them that they were to me: a lonely little 8-9 yr. old with pigtails, devoted to an almost saintly couple with no children. Mrs. Somers never was at a loss for things to do. We potted plants, cooked, must have talked about books, as I read voraciously even then. When we found a dead Yellow-Bellied Sapsucker, she helped me find a taxidermist in Putnam to get it stuffed. She showed me how to take apart a horse chestnut bud in spring to see how all the parts, the complicated flower bud and the first leaves, perfectly formed, were waiting there inside the sticky covering. In this household where our talk ranged from Dmitri Hvorostovsky and his untimely death, to wild boars and their increasing presence in the wild in Oregon, here suddenly in my mind were Madeleine and Levings Somers. Their kindness and their quiet intelligence were alive in the room. We’ve been blessed with other kindnesses lately, every one a “small plank in a small bridge” in this tortured world. This is a video our son Dexter made of a celebration on November 11th. 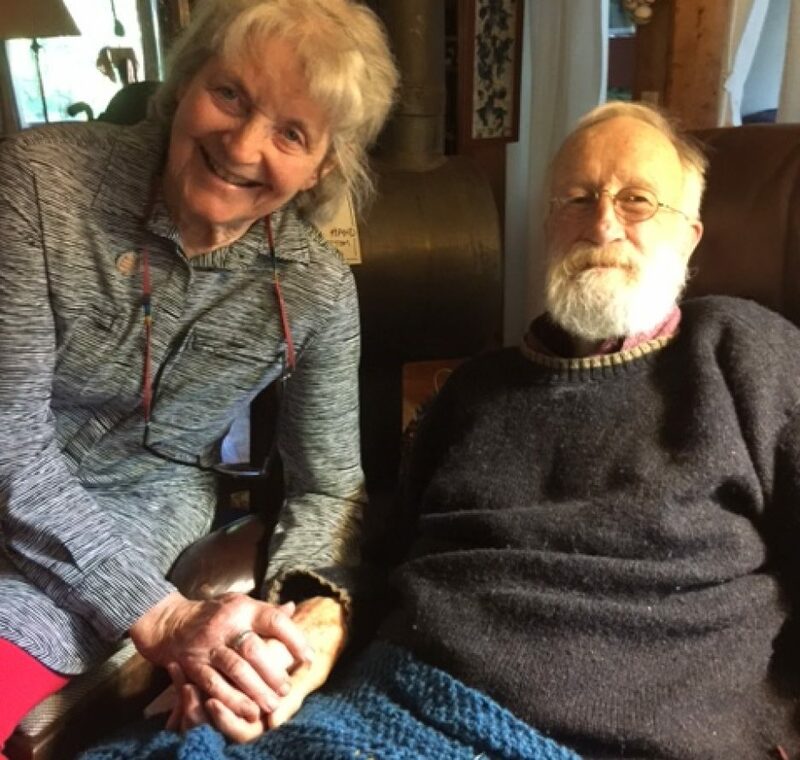 We called it A Joint Hurrah, marking milestone birthdays for Tom and me (90 and 85), and bringing together so many of the artists and other friends who are such a wonderful part of our lives. It was a wonderful, joyful gathering. And now we add another joy and another “plank”: Jamie Elsbury and our son Tom will marry in June. Love and growth and change are delightful to be a part of and to be near.